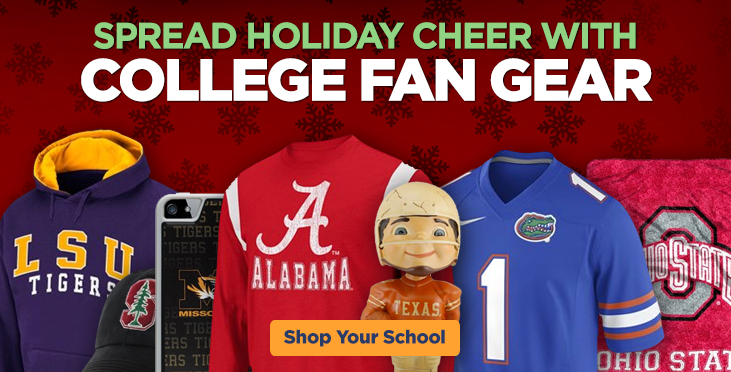 You are here: Home » Spread Holiday Cheer with College Fan Gear! Well its that time of year again. It’s time to make up your holiday gift lists. For your the sports fans in your family, Beyond Graduation has you covered. We highly recommend that you spread your holiday cheer with College or Pro Fan Gear. You will find savings throughout the season that will make providing the best licensed team apparel & gear affordable. Check out Beyond Graduations weekly specials by going to our website or subscribing to our email list. A major benefit to our email subscribers is our new product and “flash” notifications. Aside from our regular sales, you will find us offering “flash” sales where the sale is only available for a few hours. Another must-do for savings is to stop by our Outlet department, where you can save up to 50% off. Not only will you find items from all 550+ colleges that we represent, but you will also fin apparel & gear from the NFL, NBA, NHL, MLB and Nascar. Happy shopping and live by our motto: Show Your College Spirit & SAVE! ← Shop Your College, NFL, MLB & NBA Gear!